This is Volume 1 of Tempesta di Mare’s two disc project of late seventeenth century French instrumental music. ‘Suites’ of music were often compiled from stage works that were being performed at the time and presented in the form of instrumental excerpts and dances. These ‘Suites’ contain some of the most tuneful, appealing and striking music of the period, with works by Lully, Marais and Rebel. The tradition of presenting ‘Suites’ as a separate musical entity spread throughout Europe and of course continues to this day. 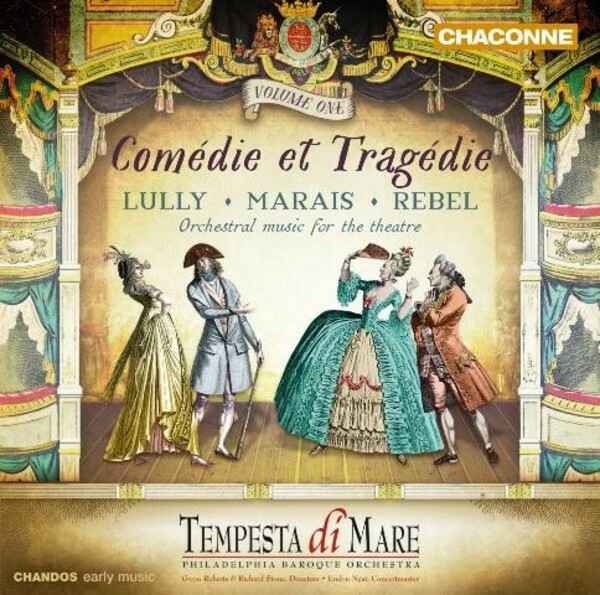 The other music on the disc was written by two students of Lully, both members of his orchestras: Marin Marais and Jean-Féry Rebel. While Marais’s Alcyone is a tragic opera (tragédie en musique), composed after Lully’s death, Les Élémens is a ballet, in which Rebel portrays each of the four elements during the chaotic, confusing creation of the world. Both works are among the most successful and appealing of their composers. Tempesta di Mare, the Philadelphia-based baroque music ensemble is presenting this project over two seasons which will comprise of workshops, concerts and broadcasts as well as the two CDs. The group was recently praised by Fanfare magazine for its ‘abundant energy, immaculate ensemble, impeccable intonation, and undeniable sense of purpose’.